bookshelves of doom: Some Fun Nonfiction. B) I'm crabby all day because I'd rather be reading my book. I've always been a big fan of factoids. I would have been totally, totally obsessed with this book in elementary school. That's what it is -- page after page after page of factoids on a broad range of subjects, from technology to history to the human body to the arts. On each page, there are references to other pages, so I've found myself flipping from page 81 (Try Being a Girl for a Day) to page 154 (Who Wants a Fight?) to page 72 (Brazil) to page 280 (What's All the Fuss About Drugs?) to page 100 (How the Ancient Egyptians Tried to Live Forever). Super fun. 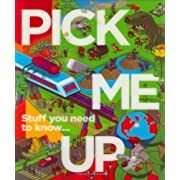 If I was still in the bookselling game, I'd probably hate this book. For real. It happens. When I was still at The Monkey, a day wouldn't go by without some gaggle of gigglers guffawing over The Gas We Pass or Everyone Poops. It got old fast and it made me very cranky. Happily, I don't have to deal with that anymore and now I'm free to be one of the gigglers. 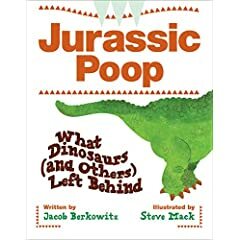 There's an illustration (by Steve Mack) of a T-Rex pooping that makes me laugh every single time I look at it. I'm not exaggerating. Very, very silly section headings like Unpooped Poop (the study of mummified remains), Turd to Treasure (the story of agate) and Survival of the Feces (how things fossilize). Fun and informative, but very short. This is the one of the three that I've had difficulty putting down. I'm going to put some time aside this weekend to just sit down and read it cover to cover. For example: Newsies fans listen up: Spot Conlon was a real person! Crutchy, too. And Racetrack Higgins. So cool. 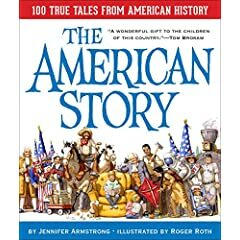 Armstrong's 100 stories are each only two-five pages long, range in time period from 1565 to 2000, cover very well-known events (the moon landing) and lesser-known events (the first potato chip). The Scopes Monkey Trial, the Battle of the Sexes, the Molasses Flood and the Donner Party are all in here. Houdini and Cher Ami and Al Capone and Lizzy Borden. Roger Roth's illustrations are fabulously detailed. Loving it in a big, big way. Thanks for featuring nonfiction! Since I've been the admin for the Cybils nonfiction category, I've realized how few people blog about nonfiction. I favor fiction myself also, but I'm also realizing just how much cool nonfiction there is out there. I had a hard time narrowing down my nomination. I'm still hoping someone nominates that new Harley-Davidson from Motorbooks. hint, hint... anyone? I read so little of it that I don't feel like I can nominate one with a clear conscience, but WOW, I am really loving that Armstrong book.